In a pill-popping world, the idea of simply providing your brain and body with what it needs for mental health is nothing short of revolutionary. 1 in 5 Americans currently takes one or more psychiatric drugs on a daily basis. Psychiatric drugs can cause many horrible side effects, some of which are worse than the original condition they were intended to treat. In fact, there is a very clear link between psychiatric medications and the violent actions of the “mass shooters” over the past few years. In many cases, these drugs are harmful and unnecessary. Caveat lector: I’m not a doctor, nor do I play one on TV. The contents of this article are not meant to replace medical advice. The data presented is for informational purposes only. There is a theory that most (and some say all) mental illnesses are caused by nutritional deficiencies. The brain is a miraculous creation that must be properly fueled in order to function correctly. Feeding your brain (and body) empty chemically created calories is akin to putting diesel fuel into a gasoline engine. It sputters and grinds to a halt, and the contamination must be thoroughly flushed out of the system for it to work properly again. Vehicles come with differently shaped fuel-filler openings, to make it difficult to put in the wrong fuel. Human beings, unfortunately, are not equipped with this type of mechanism and can therefore stuff anything and everything into their mouths and hope their body recognizes it as fuel. The brain uses 20-30% of a person’s daily caloric intake for the day. If you don’t consume enough calories, verbal fluency, problem solving ability and motivation are affected first. Then bodily functions are decreased in reverse order of necessity for life. Your brain requires essential fatty acids to maintain proper function. This is one of the many reasons that extreme low-fat diets are not healthy. Fatty acids are required to maintain connections between neurons. A lack of N3 (aka Omega-3) fatty acids may cause learning and motor disabilities, and may damage the passage of dopamine and serotonin in the frontal cortex. The most vital EFAs are 3, 6, and 9. Dopamine and serotonin are both crucial to mental health. Dopamine affects the brain processes that control voluntary movements, emotional responses, and the ability to register pleasure and pain. Serotonin is known as the feel-good neurotransmitter. This chemical is related to the ability to resist impulses. Serotonin (or lack thereof) plays a major role in things like depression, suicide, impulsive behavior, mood control, and aggression. The basic premise is that if these chemicals are not being properly transported in your brain, your mental health could suffer. A lack of Vitamin D has been linked to depression, schizophrenia, dementia, Parkinson’s disease, and Alzheimer’s disease. Research has suggested that Vitamin D is in actuality a neuroactive steroid, a chemical that is targeted by certain SSRI antidepressants. A lack of Vitamin D can negatively affect the transport of Dopamine. The best source of Vitamin D is sunlight absorbed through the skin. This may explain the prevalence of depression in the winter, particularly in regions that receive less direct sunlight. Instructions for finding the correct dosage of Niacin can be found HERE. There are loads of mental health remedies out there. Some natural ones include HTTP-5, St. John’s Wort, valerian root and passionflower. Many people swear by the efficacy of these herbs but few studies have been funded to confirm the validity of these claims. (Think about it – it isn’t cost effective for the pharmaceutical companies because you can’t patent a plant! Supplements containing tyrosine and phenylalanine are said to help with the transport of serotonin and dopamine, as well. Other vitamins and minerals that are important to mental health are: Vitamin E, Folate (another B vitamin), Magnesium, Calcium, Zinc, Chromium, B12 and B6. The first line of defense against mental health issues should always be nutritional. Take a good look at your diet and contemplate the fuel you are putting into your body. Clean out the toxins, ditch the chemical “food-like substances” lurking in your home, and start with good solid nutrition from REAL sources. Once you’ve made the required adjustments to your diet, start a food/mood journal. It’s very likely you will begin to see a link between certain foods and your state of mind. Around the holidays or when I’m on vacation, sometimes I’ve found myself in a funk, and generally speaking, I’ve been eating things I don’t normally consume. Certain foods seem to trigger this for me, particularly commercial bread products. You may discover that the issue is as much about what you avoid as it is about what you eat. From a preparedness aspect, we know that if the SHTF, we will be undergoing a lot more stress than we do in our current day to day lives. This tough time could be anything from a job loss to a natural disaster to an economic collapse. It’s vitally important to stock up on foods that promote good mental health, as well as stockpiling vitamins and supplements that can assist you nutritionally in dealing with stressful situations. Following are some sources of the most important nutrients for good mental health. I take vitamins, but I take them as a SUPPLEMENT – meaning, I try very hard to meet my nutritional needs with food first and foremost. 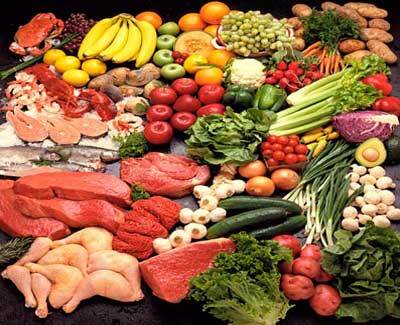 The human body is a marvelous creation, and it works better when fueled with food and just “topped up” with vitamins. This list is not meant to be comprehensive – it’s just a starting point for your pantry and garden planning. Tagged anxiety, autism, brain health, depression, insomnia, mental health, niacin, schizophrenia, sleep. Bookmark the permalink.